Palace is proud to be local and we buy local. For every $100 spent with independent $68 goes to the local community. While roughly $48 spent at a chain is re-circulated back into the local economy. Our community is everything. Santa Cruz has always been at the heart of both the “buy local movement” and our operations. We started right here in Santa Cruz in 1949 and proudly serve the businesses of Santa Cruz, Monterey, San Benito and Southern Santa Clara counties. At Palace, being an independent business isn’t just a perk; it’s our philosophy. It allows us to solve the unique challenges of your business with authority, agility and unparalleled personal care. Our team of 80+ dedicated, knowledgeable professionals is fully empowered to help you at a moment’s notice. We’re proud to deliver flexible solutions and hands-on service in record time from within this amazing and supportive community. Check out this local business infographic. It is worth every penny. Our Vice President of Furniture in Monterey serves on the Monterey Peninsula Chamber of Commerce Board of Directors where he chairs the Economic Vitality Committee. 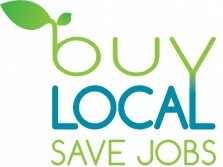 One of the initiatives of that committee is to support its members with a strong “Buy Local” program.